Moving through Tennessee, we find ourselves back in Corps of Engineer Campground territory. Defeated Creek is one of the most popular ones and we are lucky to find a spot . They closed the day we left. 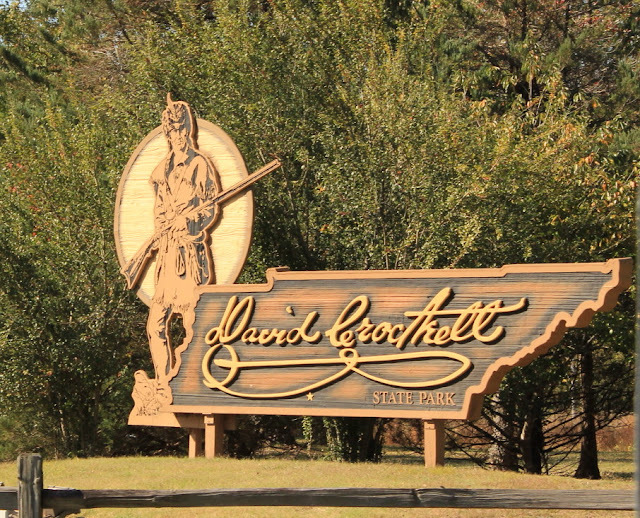 The Corps parks in Tennessee all close after Labor Day or the end of October. The families had great fun decorating for Halloween. A nice parade of kids in costume going from one site to another. The adults would sit outside to watch and give out candy and treats. Heading west, we decided to avoid the traffic around Nashville. We departed Route 40 to go south on Route 231 to 82, to Lynchburg. And Lynchburg. Oh yes, the home of Jack Daniel Distillery. We missed this on other visits into Tennessee. But , we learned that the visitor experience has improved over the years. So, we arrived at a good time. There is much information about the history and the process. The main recipe has not changed much in 150 years. A mixture of rye, corn, and barley. But the equipment has improved to produce thousands of gallons without changing the quality. 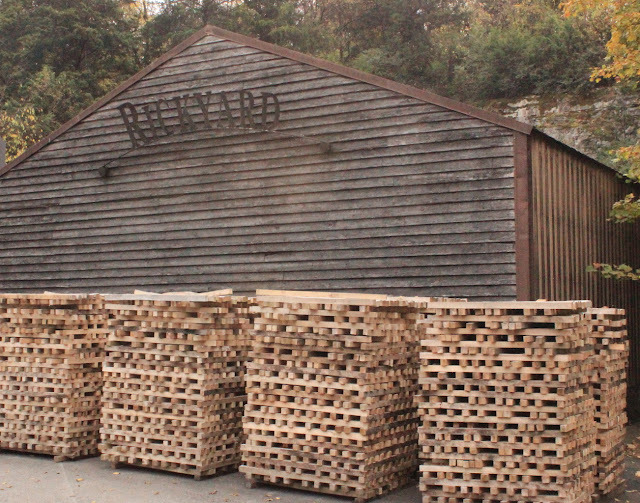 The rickyard , where stacks of maple sticks are waitng to be burned into charcoal for filtering. Some of the alcohol is siphoned off for lighter fluid to burn the wood to charcoal. This video shows a rick being burned into charcoal. The alcohol is slow dripped through 10 feet of this charcoal. 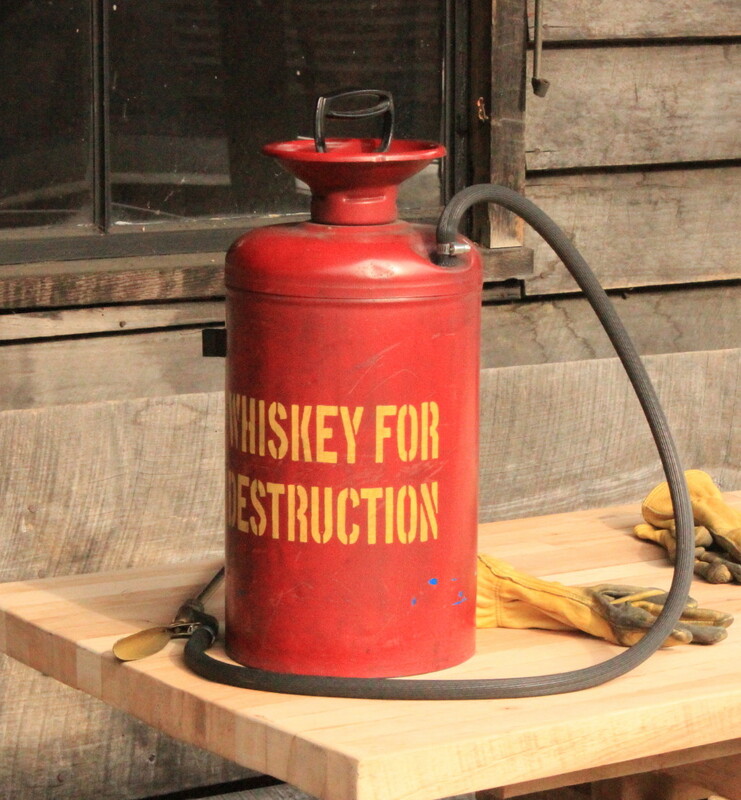 A most important part of the distillery. They have had no fires, but the alcohol is always a threat. They now have a modern ladder truck. The spring is still the same , providing millions of gallons of water. 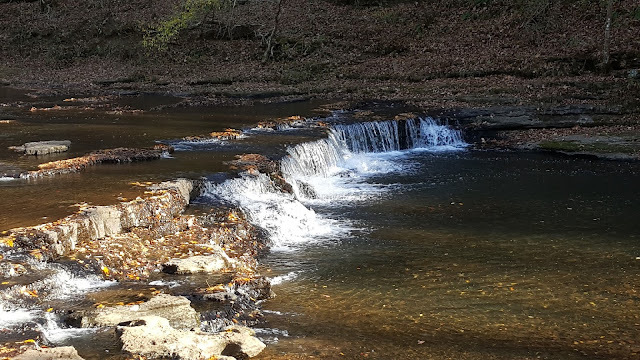 The temperature is always the same and the natural rock , limestone, filters the spring. The camera color is off . I didn't catch the red hue--probably from the lighting---but you get the idea. I was surprised to see that at the end of distilling, the whiskey is totally clear on the left. The aging in the charred oak barrels delivers the classical colors, depending on the floor- or how high in the warehouse the barrels age. The temperature varies a good bit from fairly cool to fairly hot at the top of these multistory warehouses. Out tour guide was very good. He attended elementary school in Lynchburg, one of Tennessee's smallest towns. Don't let the historic costume fool you. He is former Navy and a college graduate. you can see our tour listed which was Angel Share which focused on single barrel selects. One of our tastings was the Sinatra Select. 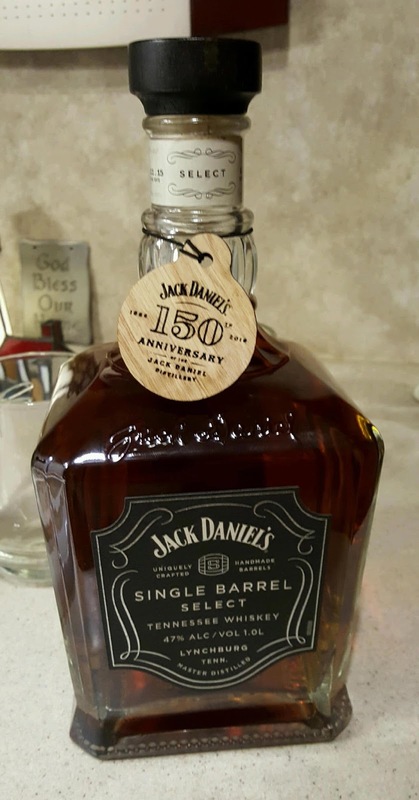 Frank was a longtime fan of Jack Daniels and would bring a bottle on stage with him (unopened? ).For the younger readers--and that is probably most of you---Frank Sinatra was the singing icon out of the 1940's that had young girls, and some older, swooning at the theaters . That was December 1942, some 12 years before Elvis Presley--for those younger----oh--forget it. I was never a huge fan of Sinatra growing up, but came to appreciate his songs and musicianship later. He had a great ear, recording early with Harry James and Tommy Dorsey bands. He was tremendous with phrasing and Bel Canto style, where the rhythm in dictated by the text or melody with notes sometimes falling before or after the beat and in unified phrases. His work is part of The Great American Songbook-classics from the early 20th century. He wanted to record new music and worked with great song writers like Sammy Cahn. With changing tastes in music , he reinvented himself at Las Vegas and hung out with Dean Martin and others forming the Rat Pack. He even involved himself in movies and received an oscar in 1954 for Best Supporting actor in From Here to Eternity. He was nominated for Best Actor in Man With the Golden Arm . "the best singer in the business"
The tasting was in an aging barn. The white oak barrels are made and charred on site. They are only used once and then sold for other uses. Some of our tour friends were from a bachelor party for a local wedding. The gentleman in the green Doyles shirt was a graduate of Boston University, so we shared a lot of history. Nice group. I did not know that Indian Motorcycles had made a comeback. Jan and I had to buy a sample, of course. Jan and I like factory tours whenever possible. This tour--$22 for an hour and a half- was an excellent one. By the way, Jack Daniels is not a bourbon, it is a Tennessee Whiskey. Davy Crockett spent much time in the frontier land all across Tennessee. This park is in Lawrenceburg. Inside the park are a golf course, a restaurant, a museum, and hiking trails. distillery. All of which were destroyed in a flood. David packed up his family and moved further west, eventually joining the Texas Alamo defense. 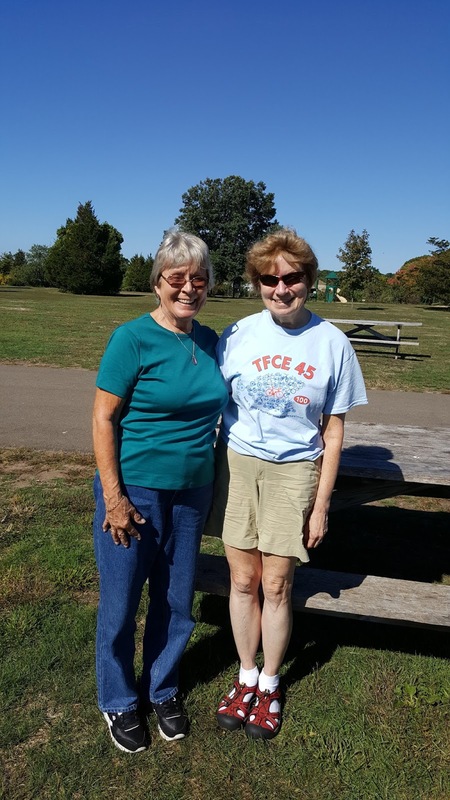 The Chickasaw State Park is set on beautiful grounds. Included is a riding stable with lots of riding trails. 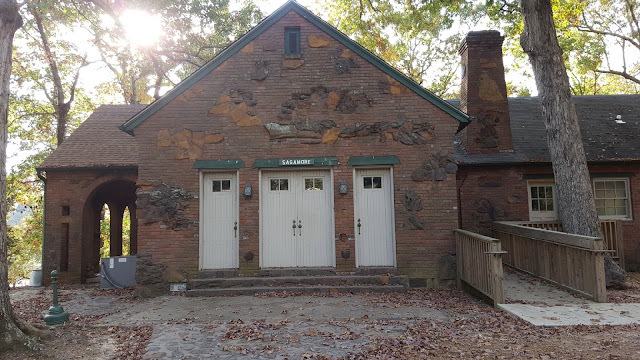 Not only a stables , but a horse camp that looks quite comfortable for the horses and their owners. Once again, we have evidence of the CCC(Civilian Conservation Corps) of the 1930's. 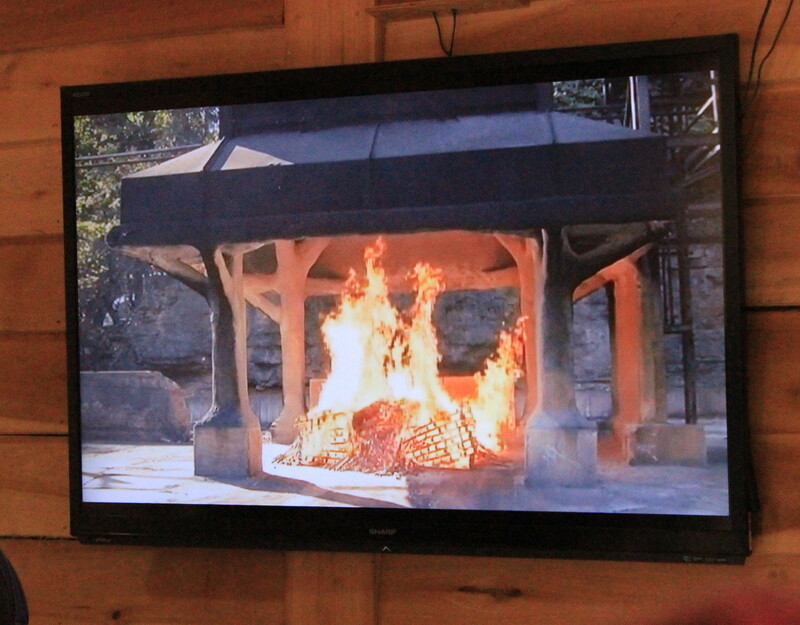 This was the Sagamore Lodge, now being attended to with a new roof and other improvements. The brickwork incorporates native natural stone . Back to Route 40 and into Arkansas. 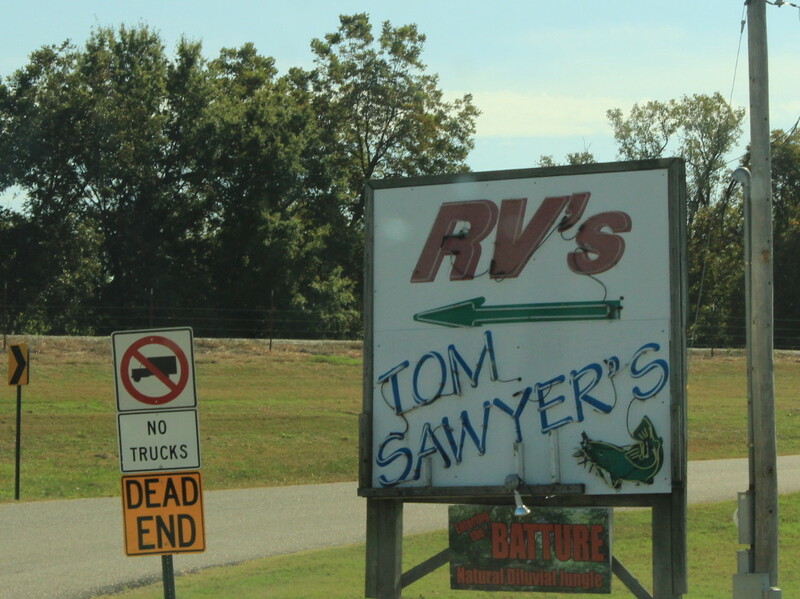 One of our favorites is Tom Sawyer's on the Mississippi River. Note the slightly confusing signs on the left. a few of the long barges traveling up and down the river. Not too far west was Village Creek State Park. What a beautiful campground. Many families here for the weekend. The campground is set up with green fields close to campsites for games. 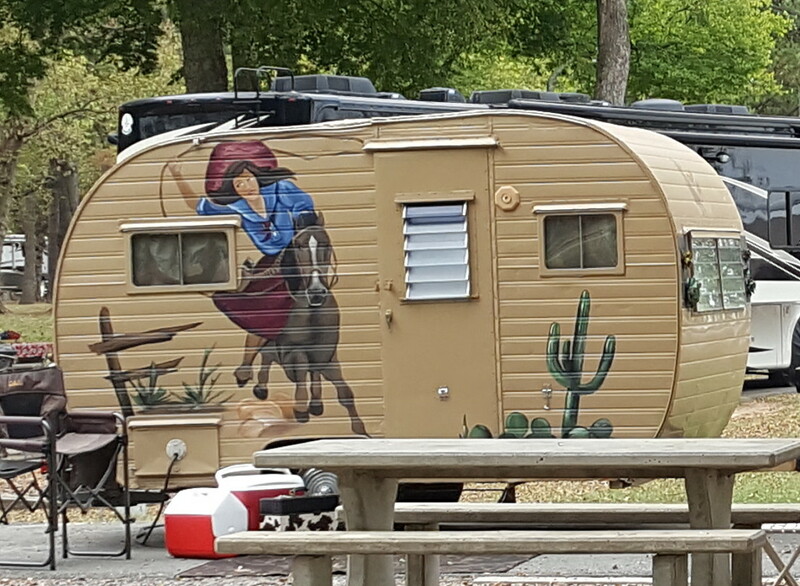 decorated small trailers . They were part of a group of single women RVers. Escapees RV Club that we belong to, but there are many other groups as well. 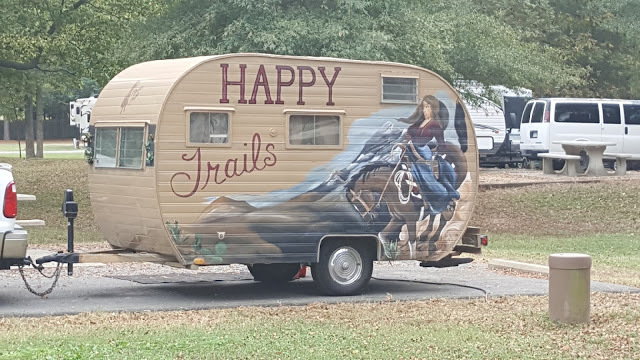 The artwork on the Happy Trails trailer is quite impressive. 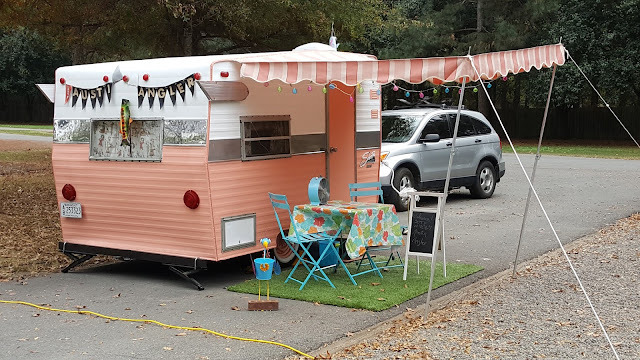 This old Shasta is totally retro. 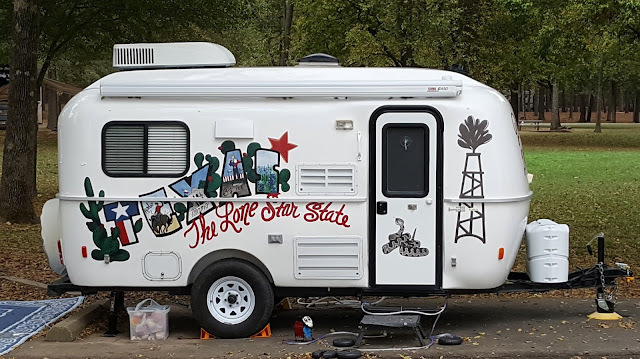 This link will show a few other painted trailers from the Cowgirl Caravan. The Happy Trails trailer is on this site. 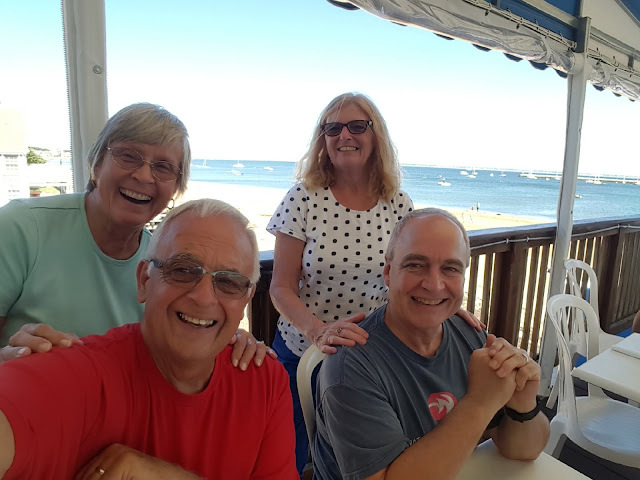 Including a few summer pics.